Greetings, Outlander! 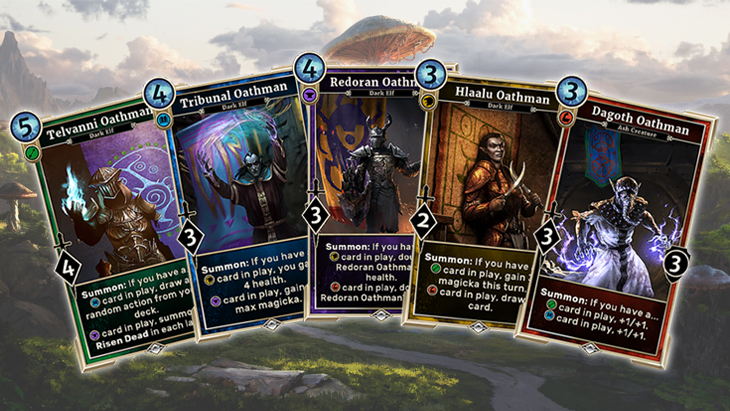 By now, you’ve gotten to see all the cards in our Houses of Morrowind expansion, so we thought it might be fun to go through some of the cards and tell some of the stories behind their designs. Here goes! Once we decided Morrowind was going to be a three-attribute set, it didn’t take us long to add something like this cycle to the file. 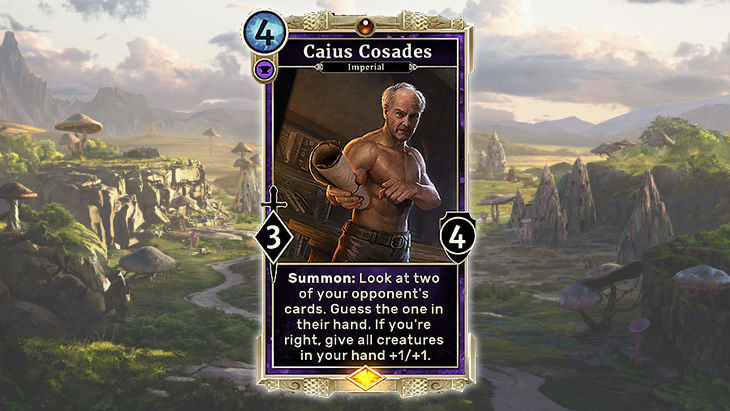 We like putting cards at common rarity that make you care about the attribute ratio of your Arena deck. Drafting is a lot more fun when you’re drawn towards certain cards for reasons other than their raw power level and since every card has an attribute, it’s an easy thing to key off of. The “Ally” cycle in the core set, for example, was created so that you might lean towards one of your two attributes as you drafted. 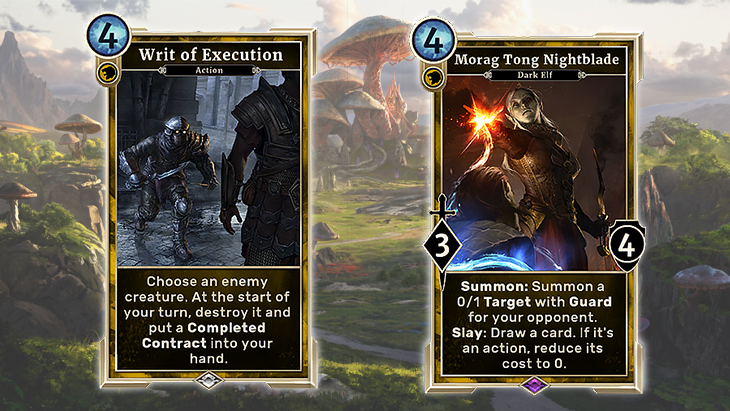 In Houses of Morrowind we wanted to make a cycle that could work in a two-attribute deck, but really sang in three-attribute decks – particularly in Arena. Originally, they were called “Allies” and checked the top two cards in your deck much like the original Allies. We soon decided that we preferred gameplay similar to the cycle cards like “Priest of the Eight” hail from in Heroes of Skyrim. Checking for cards in play gave players a lot more agency and proved a lot more satisfying. From there, we went through a lot of iteration on the abilities themselves to make sure each was generically useful, but also made sense for the appropriate House’s theme. 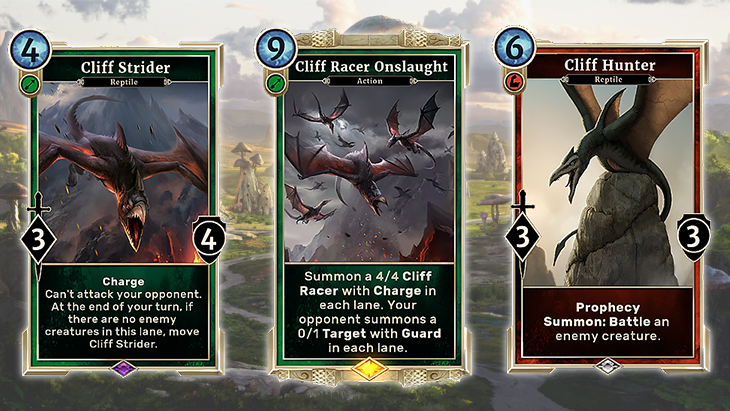 We think we landed in a place where these push you in the right direction in Arena while acting as almost a fourth three-attribute card for their respective houses in constructed. When making a set with as many themes as Houses of Morrowind, it’s important to create overlap between them. Cards that have different contexts in different Houses make deckbuilding a lot more interesting. Take Camonna Tong Heavy. He has House Hlaalu’s “Plot” mechanic but he definitely appreciates a little help from House Redoran’s “Rally” mechanic. As an aside, we normally would be a bit reluctant to make cards with Summon abilities that reference their own power or health unless the card modifies itself in some way because it’s usually a lot shorter and simpler to just say the actual number. 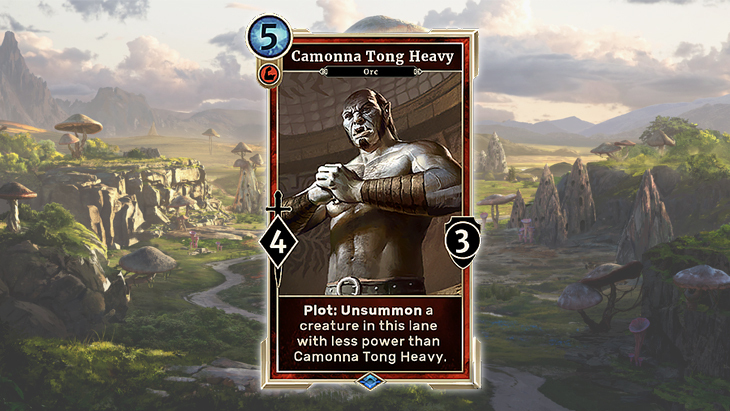 In another set, Camonna Tong Heavy might simply say “Unsummon a creature with less than 4 power.” But having Rally in the set made text boxes like this one worthwhile. You can see the same logic at work on Odirniran Necromancer and Grand Inquisitor, which also appear in Rally attributes. This little guy may look unassuming, but he’s one of our favorite cards in the set. We’re always hunting for elegant designs – that is, cards that are simple but nevertheless have a lot of gameplay to them. And that’s what Seyda Neen Courier does. This is a simple enough card that could appear in any set and could go in any Arena deck. At worst it’s a 2-cost 3/1, which isn’t embarrassing. But in this set it does so much more. For House Dagoth, that +3/+0 sword goes a long way towards creating an early 5-power monster, which can turn on cards like Ash Piercer and Ascended Sleeper. 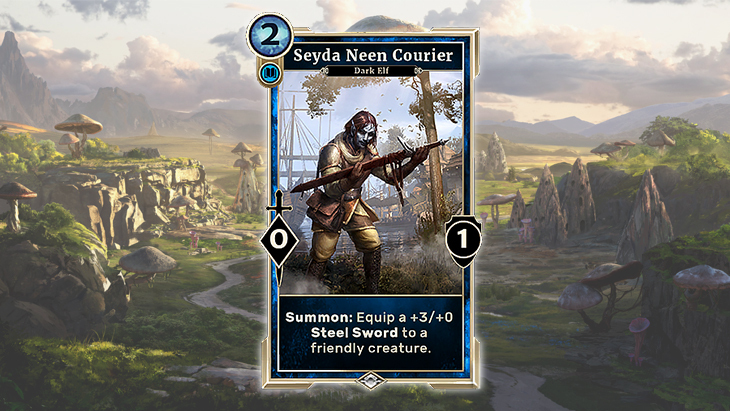 House Telvanni loves that the Courier can give away its sword and leave behind a 0/1 body that’s ripe for Betrayal. And should you find yourself in, say, an aggressive Battlemage deck, (hey, not every deck has to be tri-color) you’ll probably appreciate the way that sword can provide a little bit of burst or enable a Rally creature to trade with a burly Guard. Exalt is a great mechanic because it can help players have things to do throughout the whole game. A card like, say, Vivec City Pilgrim can act as either a 2-cost card OR a 5-cost card, making it more likely you have something to do on turns 2 and 5. There’s just one problem – while playing Exalt creatures early is often correct, it’s also not very fun. In general, players vastly prefer to use the text on their cards. So it can be painful throwing your Pilgrim out on turn 2, knowing you’ll never get that sweet +2/+2 bonus. That’s where Temple Patriarch comes in. 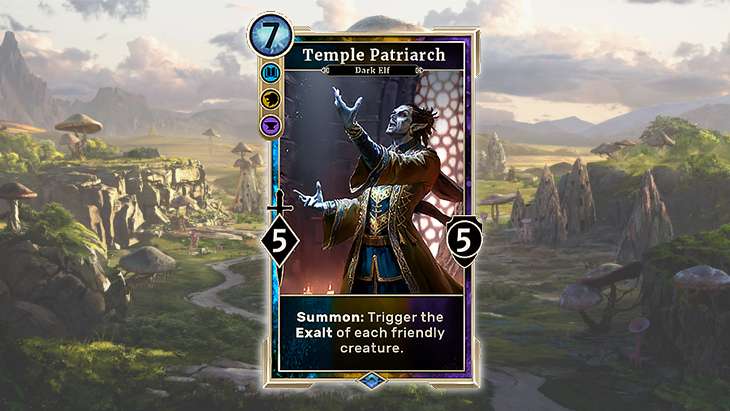 With Patriarch in your deck, playing an Exalt creature early doesn’t necessarily mean giving up on its game text. If you can keep it alive and land a Patriarch, you can have your early game cake and your late-game frosting too. It may not always work out, but we found the possibility of doing so made Exalt much more fun to build around. When Morag Tong Nightblade was spoiled, many players did a double-take. What was a slaying assassin doing in Willpower? The answer is that we were trying to make a statement about the Morag Tong. What makes them different from the Dark Brotherhood? Well, whereas the Brotherhood is a death cult that kills to honor Sithis, the Morag Tong is a respectable organization that upholds the law and kills deserving targets. Both organizations have cards in Agility – after all, they’re sneaky assassins. But whereas the Dark Brotherhood lurks in Endurance, an attribute that has a certain appreciation for death, the Morag Tong’s secondary attribute is Willpower, the attribute that seeks to impose its sense of order on the world. Writ of Execution also deserves a little digital ink. We normally don’t like cards to create cards of other attributes, but if the flavor is good enough we can make exceptions. Here the Completed Contract really sold the story and helped solidify the Morag Tong as Willpower-Agility. The clause also gave your opponent an incentive to kill the creature before you could complete your contract – perhaps by Betraying it? – creating a little more gameplay tension. Back in early Heroes of Skyrim design, we came up with a mechanic for the Thieves Guild that we called “Spy.” Spy would let you look at two of your opponent’s cards, and try to guess which they had in their hand for a benefit. The mechanic was divisive. Some playtesters loved trying to dissect their opponent’s plays and try to determine what they might or might not have; others thought the mechanic was purely random. In the end, the flavor wasn’t quite right anyway – yeah, maybe the thieves scouted their targets a bit, but it wasn’t the main thing they did. We decided to cut the mechanic, but leave in our favorite card with it – the wily cat you know as Thief of Dreams. Flash forward to early Houses of Morrowind design. Surely here was the place for Spy – after all, all of the early main quest missions in TES III are about gathering intelligence for Mr. Cosades here. Once again we designed a bunch of Spy cards and once again they were loved by some and hated by some. So what happened? At the time, the set still lacked a strong identity. Then we hit on the three-attribute set theme. As we contemplated which factions to focus on, we realized that we should be shining a spotlight on the denizens of Morrowind, not their nosy guests from Cyrodiil. Out went the Imperials, and with them went Spy. Of course, we couldn’t do a Morrowind set without capturing the Spymaster himself, so once again Spy got to survive on a single card. We’ve seen a few people ask: Why Sun-in-Shadow? Of all the great Telvanni characters, why her? The main reason is that we thought she told a cool story as a three-attribute card. In the launch set, we established Argonians in Agility and Endurance. Sun-in-Shadow is a cunning mage, the quintessential Telvanni schemer, so of course she’s an Intelligence card. But she’s also carrying her Argonian heritage with her. 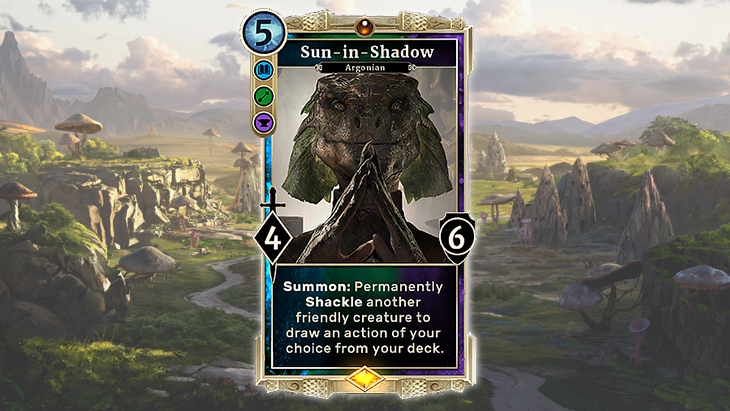 Being a tri-attribute card told a story about Sun-in-Shadow in a way it wouldn’t have for, say, Master Aryon (who you can see on Tel Vos Magister). That’s all we’ve got time for today. Hopefully this gave you a little insight into our process. Until next time, good luck to your house!